This book covers blockchain from the underlying principles to how it enables applications to survive and surf on its shoulder. 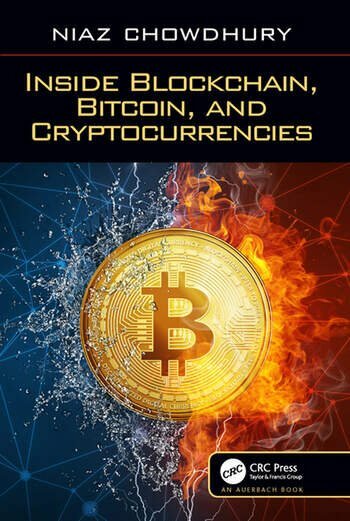 Having covered the fundamentals of blockchain, the book turns to cryptocurrency. It thoroughly examines Bitcoin before presenting six other major currencies in a rounded discussion. The book then bridges between technology and finance, concentrating on how blockchain-based applications, including cryptocurrencies, have pushed hard against mainstream industries in a bid to cement their positions permanent. It discusses blockchain as underlying banking technology, crypto mining and offering, cryptocurrency as investment instruments, crypto regulations, and markets. Part 1: Blockchain and Bitcoin. 1. Introduction to Blockchain. 2. Immutability of Blockchain. 3. Consensus Mechanism of Blockchain. 4. Bitcoin: World’s First Cryptocurrency. Part 2: Next Generation Ledgers. 5. Ethereum and Smart Contracts. 6. NEO: The Chinese Ethereum. 7. EOS: The Ethereum Challenger. 8. Ripple: Alternative Financial Network. 9. Stellar: The Ripple Challenger. Part 3: Advanced Ledgers and Applications. 10. Advanced Distributed Ledgers. 11. Blockchain Applications. Part 4: Cryptocurrency. 12. Money, Monitory Systems, and Cryptocurrency. 13. Cryptocurrency Mining. 14. Cryptocurrency Wallet. Part 5: Economic Landscape. 15. Economic Outlook of Cryptocurrency. 16. Exchanges, Trading, and Investment. 17. Initial Coin Offerings (ICOs). Part 6: Socio-Political Landscape. 18. Criminal Activities using Cryptocurrencies. 19. Regulations, Laws, and Practices. 20. Criticisms, Scepticisms, and Supports. Part 7: Background Stories. 21. Brief History of Bitcoin and Blockchain. 22. Finding Nakamoto. Dr Niaz Chowdhury is a postdoctoral researcher primarily working with the topics related to Networking, Internet of Things, Data Science, Blockchain and Machine Learning. He has diverse, yet well-connected research experiences gathered from three nations in the British/Irish Isles: Ireland, Scotland and England. He presently hold a Research Associate position in the Data Science Group (DSg) of Knowledge Media Institute, a small but renowned and well-regarded research lab within the Open University in Milton Keynes, England. Prior to this current position, he completed another postdoc in the Department of Computing and Communication in the same university working in the smart city project MK-Smart. Dr Chowdhury obtained his PhD from the School of Computing Science of the University of Glasgow in Scotland, as a recipient of the Scottish ORS Scholarship in conjunction with the Glasgow University College of Science and Engineering Scholarship. He was also a research scholar at the School of Computer Science in Trinity College Dublin where he received Govt. of Ireland IRCSET Embark Initiative Scholarship. His earlier academic background includes Computer Science and Engineering degree at East West University, Bangladesh where he pursued a bachelor and a masters degree with Gold Medal distinction.